Experts have equipped biotech workhorse bacteria with feedback control mechanism to balance growth with making protein products. Medicines like insulin and interferon are manufactured using genetically engineered bacteria, such as E. coli. 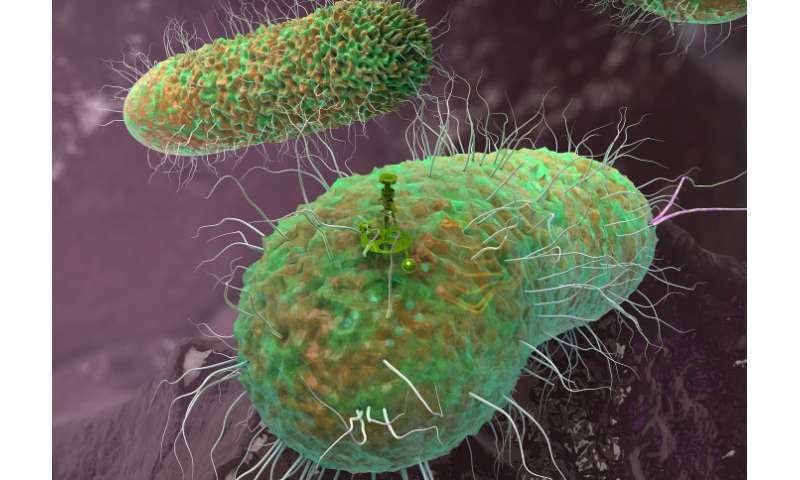 E. coli grow quickly and can be given DNA that instructs them to make proteins used in medicines and other materials. However, the extra burden of producing new proteins hampers bacterial growth, which slows production. Solving this problem is an area of great interest for biotechnology and synthetic biology. In a paper featured on the front cover of Nature Methods, Imperial College London experts have created a feedback system that lets engineered E. coli solve their own problem. This is accompanied by a second paper from the same team published in Nature Communications reporting on a new method to predict how E. coli's growth is affected by burden. Co-lead author of both studies, Dr Tom Ellis of Imperial's Department of Bioengineering, explained: "Just like a hiker having to suddenly carry a heavy backpack, we say that the cells have 'burden' - given the same resources, they now grow more slowly than their unburdened rivals. "This means that in a vat of hundreds of millions of bacteria, the engineered cells making the most product are actually those with the biggest disadvantage – they grow much slower and are less productive." To create the feedback system, the researchers first used RNA sequencing - a technique that measures the expression of all genes in a cell - to observe which genes inside the bacteria naturally change behaviour when the cell is burdened. First author Dr Francesca Ceroni from Imperial's Department of Chemical Engineering said: "Our previous work explored how making extra proteins puts pressure on E. coli and changes their behaviour. RNA sequencing told us how they do this." After identifying the bacterial DNA responsible for burden-led behavioural change, the team created a feedback loop by linking this DNA to the DNA for protein production. Co-lead author Dr Guy-Bart Stan, also from the Department of Bioengineering, explained: "Once we know how bacteria sense burden, we can link the sensing to protein production to create a feedback loop. "Once cells detect too high a burden, they trigger a feedback controller that reduces protein production to a level that allows the cell to grow well." The researchers showed that bacteria equipped with this feedback control system altered the level of proteins they produced depending on the burden. And because they now grow better, the feedback-equipped cells produced more proteins per batch because production is at a level that also allows for good growth. Dr Ceroni added: "We've given E. coli the means to allocate its own resources better during production. It's a balancing act." Both the feedback system and the new method for predicting burden focus on improving synthetic biology for fast-dividing bacteria. However, the team will now focus on bioengineering mammalian cells that produce antibodies to aid the immune response, and yeast cells for producing medicinal proteins.